We’d love your help. Let us know what’s wrong with this preview of Swift Dam by Sid Gustafson. Veterinarian Alphonse Vallerone dream It had been a long snowy winter and spring. The rivers were late rising, and the mountains held onto a pure white snow-cover. Rain fell upon the deep winter snow the day before the Flood of '64. Waters rose, the rivers raged. The dam failed to hold the Birch Creek flow, and broke, giving way to a wall of water and drowning the Indians. "Swift Dam," the new novel by veterinarian and writer Sid Gustafson, is a beautifully evocative exploration of memory and landscape, history and generational relationships. Sid knows the land intimately. He said his father used to take his sons, on horseback, into the wilderness beyond the dam, and for three years after the flood, until a new dam was built, they would ride through the wasteland scoured by the floodwaters, then through the cleft where the dam had stood. In the novel, Vallerone recalls spending days riding along Birch Creek after the flood, taking care of animals that survived, looking for bodies and tending to the people who lived through the disaster. Rib did that, too, Sid said, but there the facts end and the fiction kicks in. The mystery springs from what Vallerone discovered in the wake of the great flood, and what he goes back to find 50 years to the day after the disaster. There is very little straight detective work on the part of the sheriff, just the piecing together of history, rumor and recollection. There is also the mystery of Vallerone’s black bag, which he always carries into the hills, and around which speculation swirls. The guts of the book are the ruminations of Oberly and Vallerone on life, love and mortality. Vallerone, apparently subject to some kind of sleep disorder, has trouble keeping his dreams separate from real life, or disentangling real history from myth and misremembrance. The point seems to be that we all are disordered when we try to reconstruct the past, that we all live to some extent in a waking dream. The book is also full of veterinary particulars, which might sound dry but are anything but. Vallerone is an old-fashioned healer who does much of his diagnosis and doctoring with his hands—hence the nickname “Fingers”—and who is a proponent of the Blackfeet way of raising and caring for horses. Sid, who in his own practice specializes in the care of thoroughbred race horses, goes into loving detail about the proper care of livestock, and he takes several detours to damn the damage done to animals by modern ranching techniques and the scourge of using drugs to treat every ailment. 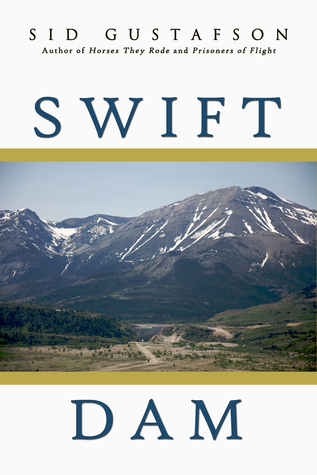 To ask other readers questions about Swift Dam, please sign up. Sid Gustafson's _Swift Dam_ punches above its weight class: written by a practicing veterinarian, it reads like the work of a celebrated Iowa Writer's Workshop prodigy, and clocking in at only 150 pages, little more than a long novella, it takes its reader into a fully flushed out imagination of a very real event. Amidst its surface tale of the broken Swift Dam flood of 1964, it interweaves three distinct stories. First, it puts forward a cautionary tale, warning us not to put too much faith in Sid Gustafson's _Swift Dam_ punches above its weight class: written by a practicing veterinarian, it reads like the work of a celebrated Iowa Writer's Workshop prodigy, and clocking in at only 150 pages, little more than a long novella, it takes its reader into a fully flushed out imagination of a very real event. Amidst its surface tale of the broken Swift Dam flood of 1964, it interweaves three distinct stories. First, it puts forward a cautionary tale, warning us not to put too much faith in modernity's bold technological breakthroughs, for the water may indeed break through them, leaving us in the devastating ruins of a failed modernity. Like Walter Benjamin's vision of the Angel of progress as a series of train wrecks piling on top of each other, Gustafson shows us the dark, underbelly of modernity, suggesting forcefully that the Swift dam was not the first dam to fail, nor will it be the last. We need to stop seeing modern technology--again portrayed in the novel as the excessive use of chemicals to treat animals--as an infallable panacea, and become more cautious of its risks and dangers. As the bumper sticker says, "Nature Bats Last." The larger second story is the tragic demise of the Blackfeet people, their lives, their property, and their hopes which were washed downstream, living below the dam. Here the story is less about the failure of modern technology per se, and more about the devastating losses caused by modernity's failure. Gustafson shows us how yet again Native Americans have born the brunt of a failed notion of Manifest Destiny which has repeatedly damaged Native people through military violence, infectious diseases, broken treaties, and now breached dams. Gustafson's third narrative, however, is perhaps his most subtle and most fully realized. Told through the eyes of an old school veterinarian who eschews the excessive use of drugs, Gustafson weaves a tale about our alienation from the land and the animals who live on it. So in addition to telling a narrative about modernity's tragic failures, Gustafson also offers a ray of hope, depicting a world in which--through animal husbandry/midwifery and Native traditions and perspectives, we might reconnect to our lands and the animals who populate them. I have read many good books over the years. However every once in a while I come across one that seems to rise above the rest and "Swift Dam" is one of those books. Although a relatively short book (listed as 160 pages), it is a complex, interesting, and compelling story. Perhaps I am a bit biased; but it contains many of the elements I find important in a good read. These include a strong sense of place and the connection between humans, the land, animals, and one another. It is set in and arou I have read many good books over the years. However every once in a while I come across one that seems to rise above the rest and "Swift Dam" is one of those books. Although a relatively short book (listed as 160 pages), it is a complex, interesting, and compelling story. Perhaps I am a bit biased; but it contains many of the elements I find important in a good read. These include a strong sense of place and the connection between humans, the land, animals, and one another. It is set in and around the Blackfeet Indian Reservation south of Browning, Montana. The story involves the mysterious, nocturnal wanderings of country veterinarian Dr. Alphonse "Fingers" Valerone and his connection to the failure of Swift Dam during catastrophic flooding of 1964. Although an outsider, Fingers develops close relationships with the Blackfeet Indians and learns many things from them that help him in his veterinary practice. He also learns that water can bring both life and death and is impossible to control. Sometimes, the old ways may be better in the long-term and perhaps the spirits can lead us in the right direction if we are open to hearing them. This book reminded me to a degree of some of the works of Ivan Doig, one of my favorite authors. The setting is the same as a number of Doig's novels and the ending is both unexpected and heart-warming. I am the novelist who wrote Swift Dam. Certain readers like to hear from the writer, so this review is for you. I am uncertain of the etiquette here, but to me it is appropriate to provide an afterword in this forum. I did read the novel after its publication after several months of laborious but rewarding revisions. The words now appear in their best possible, it seems to me. As a writer reading his own work, I am satisfied with the story's published version. This view could change with time. I became witness to the Flood of '64 as a nine-year-old living near the tragedy. My father, Rib, a veterinarian and horseman, was called to help with his horses to scour the ravaged Birch Creek river valley in search of survivors, the seed of this novel. The river was hard to reach, their search curtailed. The only actual events in this novel are the breach of the original, earthfill Swift Dam by water in 1964, the ensuing drownings, and the digression regarding the horse named Spokane. At this time, I see my third novel, Swift Dam, as an entertaining, educational, and textured allegory regarding the complex and evolving relationship between mankind, nature, water, and animals. As the author, I am honored and pleased with my publisher, Open Books, the editors David Ross and Kelly Huddleston, the outcome, the reviews, and the sales. A world unknown to many is revealed in my best cinematic literary fashion; Swift Dam is a poem, a story, a metafiction; an allegory, a plea, a eulogy. It is dedicated to victims of the Flood of 1964. This was an interesting read about a catastrophic event in Montana in 1964. The story was rather slow. I enjoyed this book very much. the style of writing is unique I felt like I was a trusted friend hearing a story of the real and raw and humorous and sometimes grand stories of a remarkable human being. Sid Gustafson, novelist, veterinarian, equine behaviorist. Sid Gustafson lives in Bozeman, Montana with his children Connor and Nina where he writes, teaches, and practices his natural approach to equine veterinary medicine up and down the Rocky Mountain Front Range. Sid was born in Montana, as were his children and parents. He grew up in the shadow of the Blackfeet Indian Reservation, and frequen Sid Gustafson, novelist, veterinarian, equine behaviorist. Sid Gustafson lives in Bozeman, Montana with his children Connor and Nina where he writes, teaches, and practices his natural approach to equine veterinary medicine up and down the Rocky Mountain Front Range.